Bio Health Periagna - Agnus Castus (Vitex agnus castus L) is a traditional herbal medicinal product used to help relieve premenstrual symptoms such as irritability, mood swings, breast tenderness, bloating and menstrual cramps, based on traditional use only. There are no other ingredients in Periagna. Please read leaflet carefully before using Periagna. It contains important information about this medicine. you are allergic to any of the ingredients (see section B of enclosed leaflet). you have a history of, or are suffering from a current pituitary disorder. Side effects may include minor stomach upset and a mild skin rash with itching. Agnus castus is not recommended for use during pregnancy and should not be used concurrently with hormone therapy (e.g., oestrogen, progesterone). 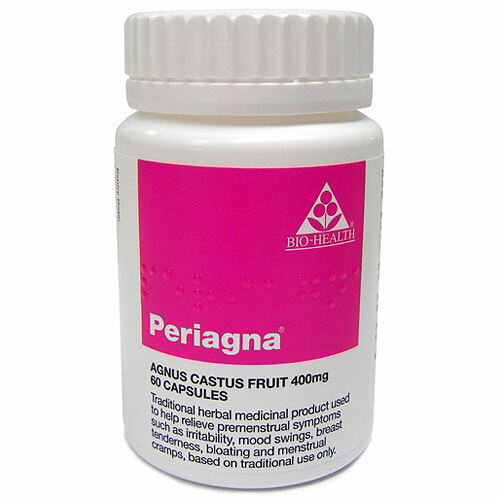 Below are reviews of Periagna - Agnus Castus - 60 x 400mg Capsules by bodykind customers. If you have tried this product we'd love to hear what you think so please leave a review. Fantastic product. This has really helped my menstrual cycle become longer (went from 21 day cycle to 27 day cycle). 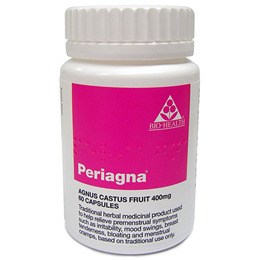 Bio Health Periagna - Agnus Castus is a traditional herbal medicinal product used to help relieve premenstrual symptoms such as irritability, mood swings, breast tenderness, bloating and menstrual cramps, based on traditional use only.